We’re not sure why this isn’t on by default. 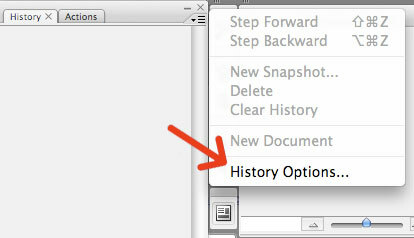 In Photoshop, go to the History palette, select the indicated area, and choose “History Options”. Then in the next screen, check “Allow Non-Linear History”. Deleting a “state” deletes that state and those that came after it. If you choose the Allow Non-Linear History option, deleting a state deletes only that state. Photoshop is the #1 graphics design program. You could literally learn something new every time you work with the program. I was surprised at how many professionals were not aware of using the Control key for greater control over the program. Holding down the Control key while using the mouse allows for more precise work flow. Example: Using the mouse alone when bringing rulers onto the page will snap to areas on the page that you’re not interested leaving a ruler. For more control, hold down the Control key and the mouse to put your rulers exactly where you want them. Whenever you need more precise placement with other tools, try holding down the Control key. You’ll discover that this function is not limited to rulers.